How slippery is your floor? To prevent slip accidents it is essential that you know. Surefoot Systems can provide a comprehensive slip assessment testing service using equipment fully approved by the HSE. A detailed report is provided following testing that gives slip resistance figures that are recognised by the HSE and United Kingdom Slip Resistance Group. There are many different types of device for measuring Slip resistance. Surefoot Systems uses SlipAlert and Pendulum slip testing. SlipAlert is the only machine which has been specifically designed to correlate with the Pendulum, which has proven over many years experience to provide a reliable assessment of the slip resistance of flooring. 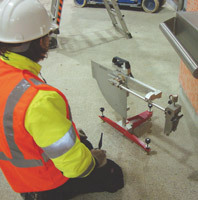 The Pendulum has become the ‘Gold Standard’ of slip resistance testing in the UK. An onsite test can be invaluable to assess the risk before the accident occurs. Surefoot can assists with the Risk Assessment and survey of all types of hard flooring by providing an onsite slip assessment service. This test will definitely determine how dangerous a particular floor surface is using a recognised British Standard test method. By testing the flooring material before it is installed could save many thousands of pounds in costs and give the opportunity to amend the specification before it is too late. If you are considering the installation of any type of hard surface flooring material and would like to know how slippery this material is before it is installed Surefoot can undertake in house testing of individual floor samples.